When kids are crawling, just learning to walk or still mastering the potty, the convenience and comfort of a bubble onesie, romper or jumpsuit is everything. From Oeuf’s eco-friendly floral print romper to Rylee + Cru’s made in the USA gender neutral jumpsuit, here are eight all-in-one looks we love. 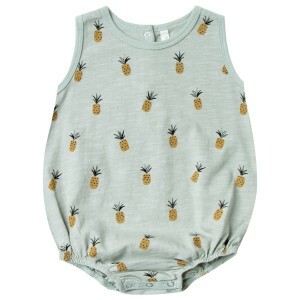 Made in the USA out of super soft cotton, Rylee + Cru’s gender neutral pineapple themed onesie can be worn on its own for fun in the sun or layered under clothing for extra warmth and style. 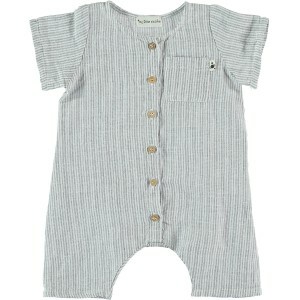 This Sproet & Sprout supple loose fitted romper has a fun and understated playing cards print and is simply adorable! Designed with an elastic band on the back, adjustable straps and snaps on the bottom, outfit and diaper changes are a breeze. With hand smocking and sweet pom pom detailing, the adorable Bonheur du Jour Smocked Pom Pom Onesie is truly an heirloom piece. Machine washable and made to last, it’s a look that will never go out of style. With a cheeky hot pepper print, handy back snap closure and two front pockets, Sproet & Sprout’s Jumpsuit is a playful onesie any little tot will love. Made of 100% organic cotton, the I Dig Denim Davis Romper is perfect for playdates, but equally comfortable for when naptime calls. Easy to wear on its own, you can also layer a shirt underneath or sweater on top for the cooler months. 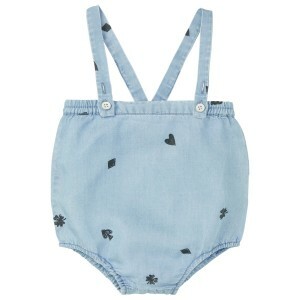 The Oeuf Romper’s sweet floral print is just in time for spring flings and summer dreams. 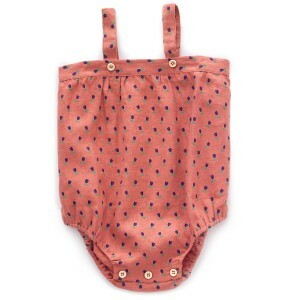 Made in Peru out of eco-friendly linen, it’s a suit that lets kids move and groove while looking all sorts of cute. The understated palm print on this Rylee + Cru Jumpsuit makes it an easy to mix and match suit for spring and summertime fun. Designed with snaps at the bottom and a front wooden button placket, outfit and diaper changes are a breeze. The boho inspired My little Cozmo Vintage Stripes Jumpsuit is super soft, super cute and a great neutral piece to have in any tot’s wardrobe. Particularly great for the warmer months, its soft linen-cotton blend provides comfort and breathability. We just wish it came in adult sizes!